My dad started to teach me how to play chess when I was a little boy of about 5 as far as I can remember. I’ve been playing ever since, and consider myself to be an above average player. My father is a much better player, and studies and practises the game on a regular basis. Consequently we had a few chess programs on our computer, there are three that we made use of on a regular basis, Battle Chess, Sargon 4, and Cyrus chess. 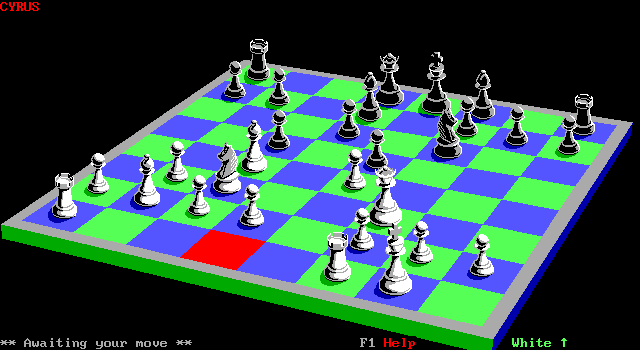 Cyrus chess was created by Intelligent chess software in 1985. There are many options and setting that allow you to set the level of play, and the engine seems to be reasonably strong. The 3d graphics for the chess board are quite pleasing and make it easy to identify the pieces on the board. The program keeps a record of your game that you can print out or save for later analysis. The user interface is not so nice to use as it does not seem to support the mouse, and the menu system is a little counter intuitive at times. Still this is a good chess engine that will give you a reasonable challenge, it’s just not for novices. You can play the game multiplayer via hot seat, but there isn’t a lot of point as a real chess board is much nicer. 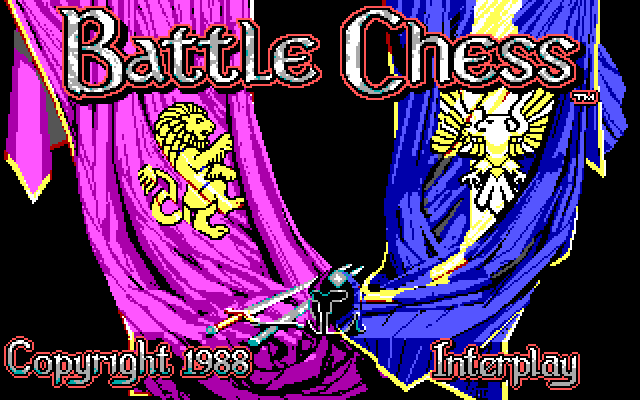 Made by Interplay and first released in 1988, Battle chess is the first of its kind. The version I have is for DOS and uses EGA graphics to display the playing area and are very pleasing to the eye, especially considering the era of the graphics. The pieces in the game are animated and engage in combat to destroy each other when one piece takes another in the normal game of chess. All of these animations are amusing, and some have reference to popular movies such as monty python and the holy grail. The chess AI is not as strong as other programs, which makes this program suitable for novice players who don’t have a lot of experience playing. There is no facility to record your games, but there is multi-player over modem or hot seat play which is nice, and lets you have fun smiting your friends. I found the chess AI adequate for my needs, but it would not suite someone who is training for competition or is already a very good player. I’d recommend it for anyone looking for a bit of fun, or anyone who is a casual chess player. Sargon 4 was made by Spinnaker software back in 1989 and is descended from other chess programs of the same name that were on multiple platforms. This program has many features that can be helpful in becoming a better chess player. It is by far the favourite program that my Dad uses when he is trying to prepare himself for a competition. The engine has quite a history of being quite strong in its previous incarnations on other platforms, and this version for DOS does not disappoint. It has a full opening book that it uses to decide the early phases of the game, it tells you what opening you’re using and what variant which makes study easier if you need to look up whats happening in a book at a later time. The interface is mouse driven and is usable by someone who isn’t a computer genius. You adjust the computers difficulty by adjusting the amount of time that the computer has to think. This means on modern systems you can be playing against a very strong player if you’re not careful! I recommend using Dosbox to play this game as you can use the cycles count to also help adjust the difficulty of the computer opponent. You can print out board positions and game listings for later analysis which is good if you want to study the game you’ve played. I recommend this program for better players who want to improve their game or just want a decent opponent. Starfire is an arcade game written by an Australian, Paul Turbett in 1992. The game appears to be based on a commodore 64 game called Uridium. It is a vertical scrolling space shooter that has the player destroying large vessels that have come to destroy earth. You do this by travelling to the main power reactor at the end of the ship and destroying it. In order to get to the reactor you need to fly past the ships defences which consist of fighters, turrets, homing mines and physical barriers. Of course like other games of this type the main goal is to get a high score which you do by destroying as much of the enemies as possible. To assist you in doing this you get power ups on a regular basis, some for weapons, some to restore shields or bombs, and the most useful one, invincibility. You will note that power ups you don’t need do not appear. This can be handy if you manage to get yourself to full health, lives and weapons you will usually get a invisibility power up. In this way you can get through a level without much damage. The graphics are fairly simple and attractive, and the sound is ok in PC speaker mode. Adlib and sound blaster support is included, but there is a peculiar hissing sound in some of the sound effects. I quite enjoy the gameplay, but there is little challenge once you start getting a string of invincibility power ups. The levels and the game itself are quite short, and can be completed within a very short time frame. The controls in game are quite good, I found the best way to maneuver was with the numeric key pad, keeping my left hand free to use the other keys as needed. However it is not shown anywhere in game which keys you use for control in game, or within the menus. It could make things difficult for someone new to the game. There is a two player mode, but all that really does is allow two players to play the game in a hot seat style. It makes the feature pretty much pointless, and it should have been easy enough to add simultaneous play, although I suspect that may have made the game too easy. There was also a registered version which I’ve never played. The documentation says that it only adds four more levels.